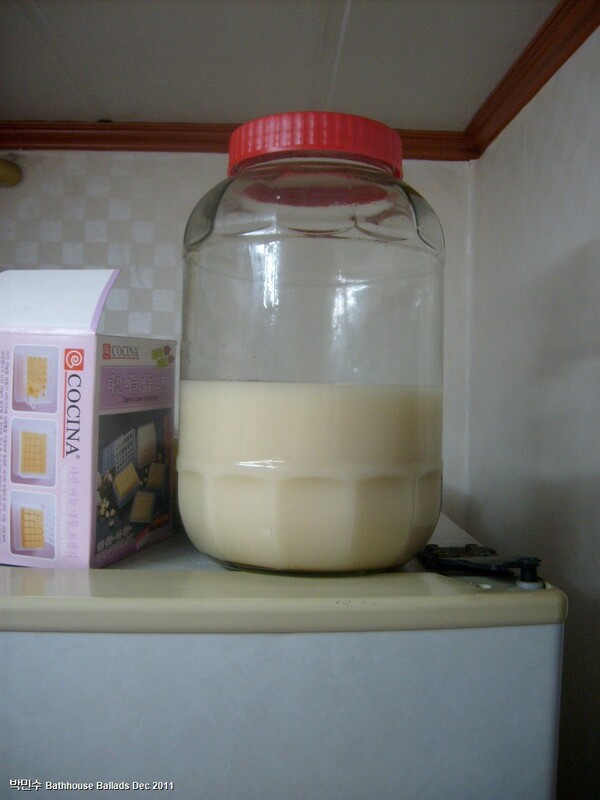 I’ve been searching for a Korean rice wine (makgeolli / dong dong-ju) recipe for over ten years and it’s only been in the last two years that information has begun to surface on the internet. 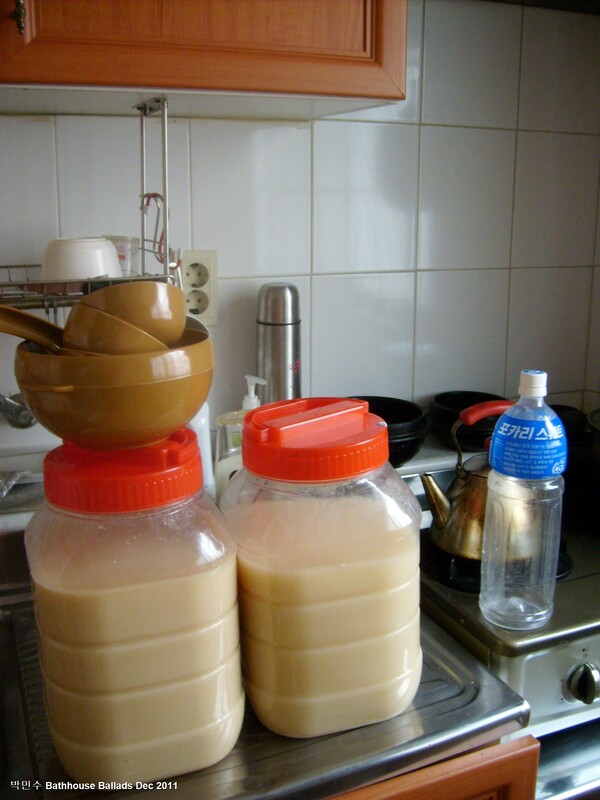 You can sink this unique Korean drink with as much ease as glass of milk, especially when the weather is hot or you are thirsty and it is often an accompaniment taken on hikes up the mountain or wherever there is likely to be some physical exertion. Several of my friends told me it would be difficult to brew either makgeolli (막걸리) or dong dong-ju (동동주) but after one failed attempt, the failure caused by too warm an environment for the mash, a successful batch emerged. Though it was a little weak, it was perfectly enjoyable. My next five batches significantly increased in size but ended up being rather bitter. I could have added a lot more sugar to compensate but didn’t and three weeks later, they are still fermenting. I blended these five batches together and while they are certainly stronger than a strong wine (14%), they are not as potent as soju (around 20%) so I reckon the kick is about 16-17%. I made batches of both makgeolli and dong dong-ju though to be honest there seemed to be little difference between them and I ended up mixing both types. The recipe below is based on my sixth batch (11th December 2011) though I suspect I might have to reduce the amount of wheat yeast to curb a tendency towards bitterness and sourness. I am not yet fully sure what nu-rook yeast (누룩) is though I do have a Korean recipe for it. Some sources define it as wheat yeast, others as blend of wheat and barley yeast. I do have a makgeolli recipe that uses wheat and barley grains along with the rice, boiling them together and simply adding standard yeast to make the mash. This I will try in the future. If you are in Korea, you can buy nu-rook in markets – I’ve not yet found it in any super-markets. I’ve discovered the yeast that looks like small seeds, as opposed fine powder, is not effective. Stick to very fine yeast, preferably dried. Sources I researched varied in the temperatures they recommended in which to sit the mash. My first batch, perched on top of a rice cooker, was too warm and the mash failed to initialise and by the third day a mold contaminant had spoiled the batch. The next five batches sat in a warm corner of my room with the ondol floor heating on for around five days. The room temperature was around 27 degrees centigrade and uncomfortable but jars were very active. I’ve subsequently found that fermentation will occur at 20 degrees (centigrade) and even at ten it continues. Most of my sources suggest leaving the mash to ferment for 3 days to a week before filtering it. They also said to bottle the final alcohol but since I’ve had two bottles come close to exploding, I’ve used a large plastic screw jar, which probably hold a gallon and I’ve left the top loosely screwed in place. It is quite amazing the amount of gas that occurs during fermentation. One source said not to open bottles for two weeks! One of my bottles exploded like a champagne bottle after only 9 hours, so be cautious! I have recently started punching a small hole in the tops of the plastic bottles I store rice wine. 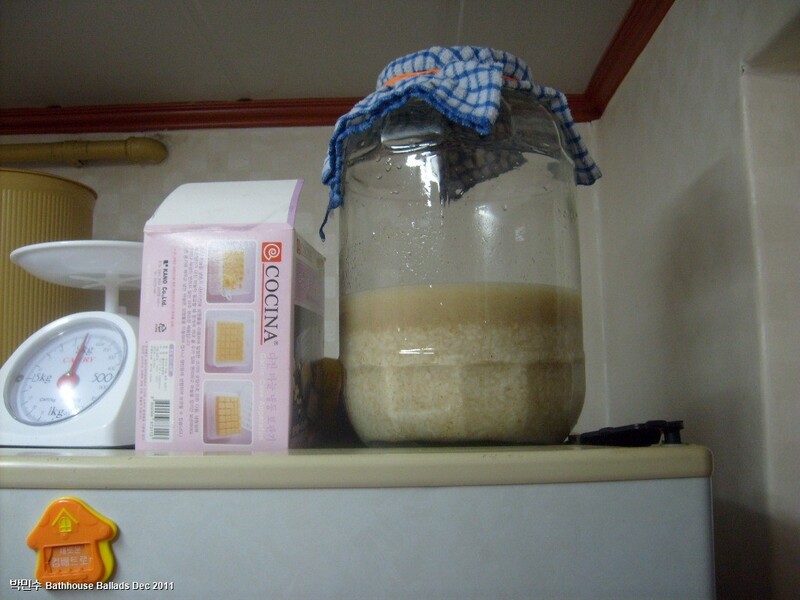 (Ten years ago, before you could buy canned or bottled rice wine in which the fermentation process had been terminated by boiling and subsequently, often carbonated, the plastic bottles in which you bought the wine had a small hole in the cap). Make sure all utensils are boiled or washed in the sort of solution with which you sterilise a baby’s feeding bottle. I also swish out the jar with some soju or vodka prior to filling it with the mash. The most tiresome part of the entire process is washing the rice. 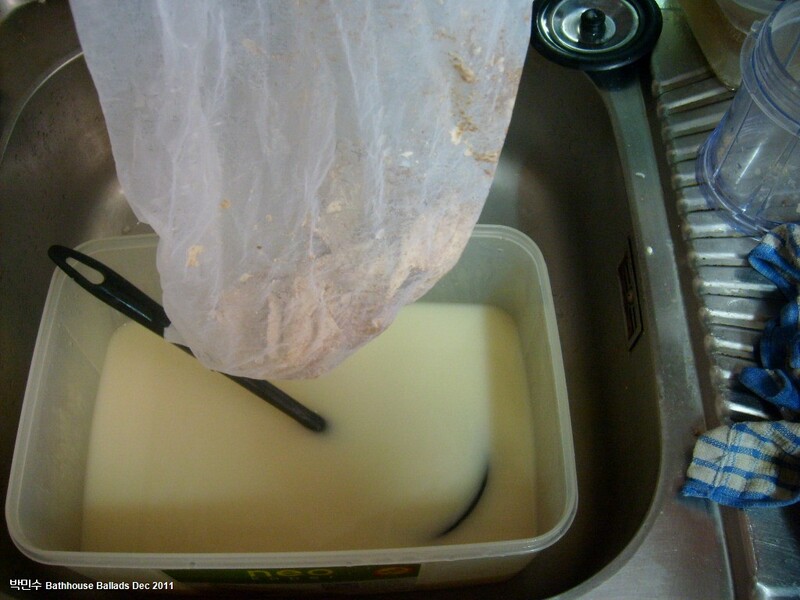 I’ve discovered using a plastic ‘muslin’ bag, or a muslin bag makes this process much easier. rice cooker, large glass container, large rubber band, boiled cloth which can cover jar, muslin. Wash the rice 20-30 times – until the water in which you swish it remains clear. When the rice is cooked let it stand for several hours before turning off the rice cooker to let it cool. 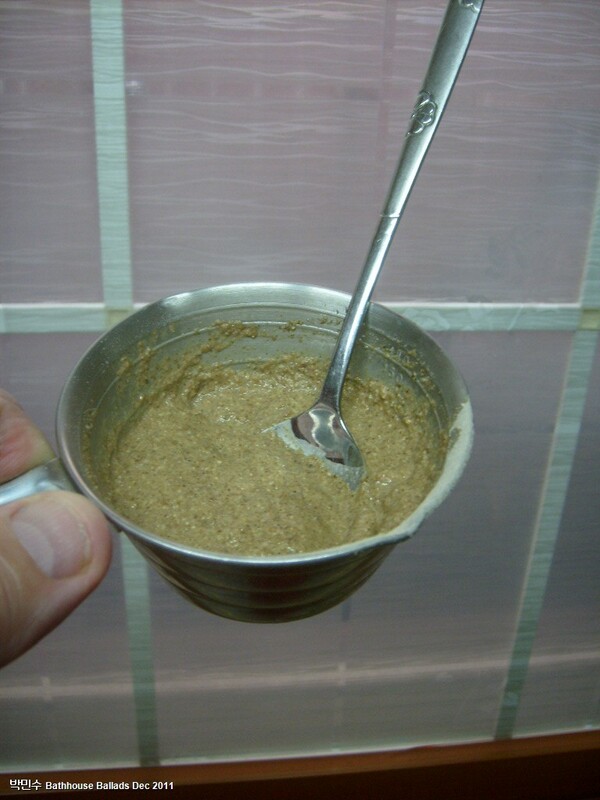 In a sterilised bowl and the ground nu-rook and yeast and mix it with a little warm water until it is a paste. Do not be tempted to do this in a blender as it might explode. Put the rice into the glass jar and add about 1 liter of water. 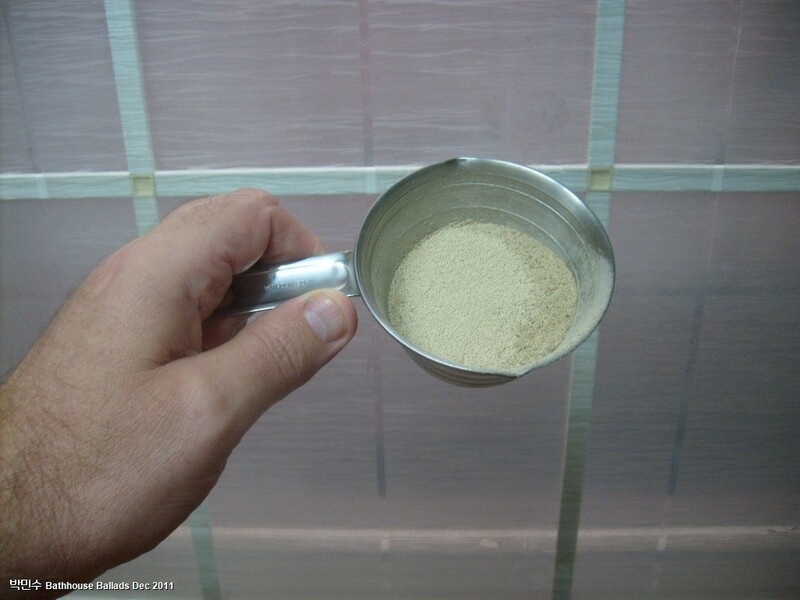 Mix the ingredients before adding the blended yeast inoculate and then mix together. You should now put a sterilised cloth over the jar and secure it with an elastic band. Stir the mixture once in the morning and in the evening being sure to do so with a sterilised ladle. You will know if the mash as initialised as you will both see rice particles floating up and down in the jar and see and hear the exchange of gases. From the third day, though I might possibly wait until the fifth, you can pour the mash into a sterilised muslin bag and then proceed to squeeze liquid out of the rice into a storage vessel. Sugar, or corn syrup etc, can be added at this stage and the brew diluted to taste with spring water. In batches 6 and 7 I used about a liter of water. Both types of rice wine are commercially sold at about 5% alcohol and supposedly the undiluted brew from this recipe is around 16%. At an estimate it is probably about 7% if diluted with a liter of water. It is often mixed with Sprite or Chilsung Cider and also drinking yogurt and this is especially useful if the brew is a little bitter or sour. Fermentation will continue after this process but the brew is now ready to drink but give the contents a stir or shake before pouring. NOTES ON BATCH 6 (removed from fermentation jar on December 16th after 6 days at around 22 degrees centigrade). As I mentioned earlier, I added 1 liter of spring water to the wine and about half a cup of corn syrup. There is only a touch of sourness with no bitterness. This is the best batch I’ve made so far in terms of balance. Batch 7, prepared on December 16th, uses slightly less yeast – update to follow. I have used several sources in the quest for the best recipe but I am indebted to Max from Zedomax.com. This was the first decent recipe I found and without his help I’d still be floundering. Cheers, Max!